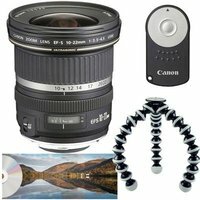 This Landscape Kit includes the Canon EF-S 10-22mm f3.5-4.5 USM Lens, Canon RC-6 Remote Control, Joby Gorillapod SLR Zoom tripod, and Canon Portrait and Landscape Photography DVD. The Canon EF-S 10-22mm lens features a focal length range of approximately 16-35mm in 35mm format and is a remarkable lens with outstanding image quality that will take your photography into new dimensions and areas of dramatic expression. This lens allows you to get extremely close to subjects, exaggerating the difference in size between a near object and its background. The Canon RC-6 remote is a wireless IR remote control that allows you to operate the shutter from up to 5m away. The Joby Gorillapod SLR Zoom tripod is a portable tripod with a maximum load of 3000g designed for the travel and enthusiast photographer in mind.